Vitrue has launched an Instagram “tab module” for brands to use on their Facebook pages, using Instagram’s API to automatically import a selection of pictures based around a specific tag and create albums. The social media marketing company claims that this is an industry first. Perhaps more importantly, it is also a sign of how marketeers are trying to incorporate more visual elements into their Facebook campaigns to make them more engaging with users. The albums work much like the Instagram albums that may already appear in your own personal timeline if you happen to post pictures to Facebook: users will be able to like, comment on and share the pictures with their friends. Vitrue says it is also going to incorporate a voting element into the mix as well, which will let brands run contests around the Instagram content. And there are some other key features. The tagging element will let brands create albums around specific campaigns; the album creation is automatic and requires no “posting” from the users; and Vitrue is selling this as a product to its customers, as part of its Social Relationship Management platform, which also includes analytics to measure how well these campaigns do. “There is no revenue sharing with Instagram in this,” says John Nolt, Vitrue’s director of product management. The addition of Instagram comes in the wake of Vitrue integrating another hot social media property into the SRM platform, Pinterest. Nolt says its Pinterest integration was launched a couple of months ago and has around a dozen brands using it already. 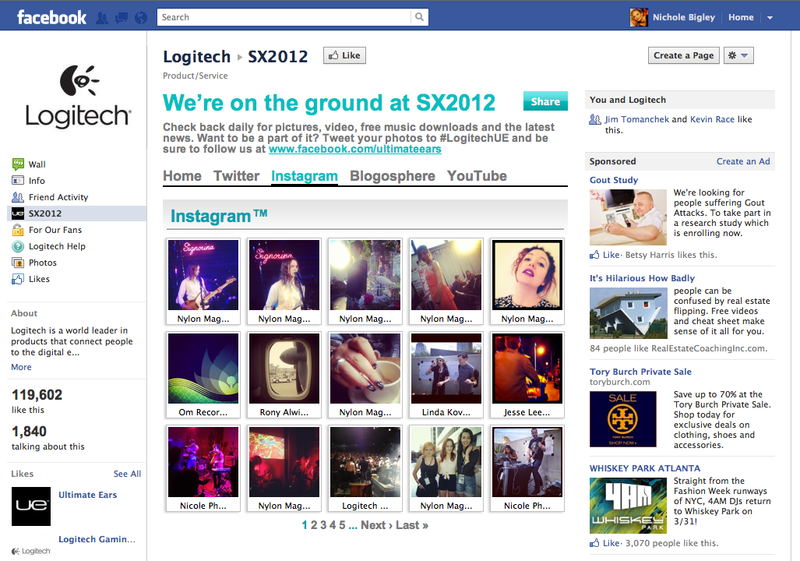 Vitrue’s first customer for the new Instagram feature is the consumer electronics accessory giant Logitech, which used it to import music and pictures from the SXSW event earlier this month. Nolt says that Vitrue is also working with around half a dozen other brands at the moment and expects to see their Instagram feeds go live on their Facebook pages in the next 15-30 days. Although Hipstamatic and Instagram are now beginning a new partnership that will see Hipstamatic becoming the first company to import images to Instagram’s own social network, Nolt says there have been no conversations between his company and Instagram either about the new Facebook service, or about any potential marketing partnerships on Instagram’s own platform. Although Facebook is probably the world’s biggest cloud-based repository of images at the moment, it’s unclear whether it has any services like this — catering to marketers, filtering those images — up its sleeve. But with the layout of Facebook still largely text-driven, it’s a fair bet that brands, craving more visually-led methods of engagement, will probably be on the hunt for more like it.